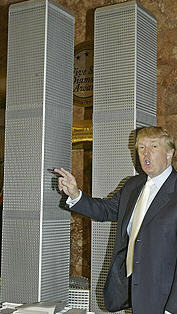 "In a nutshell, the Freedom Tower should not be allowed to be built," he said. "It's not appropriate for Lower Manhattan, it's not appropriate for Manhattan, it's not appropriate for the United States, it's not appropriate for freedom." * Actually, we really think it's an empty PR stunt.